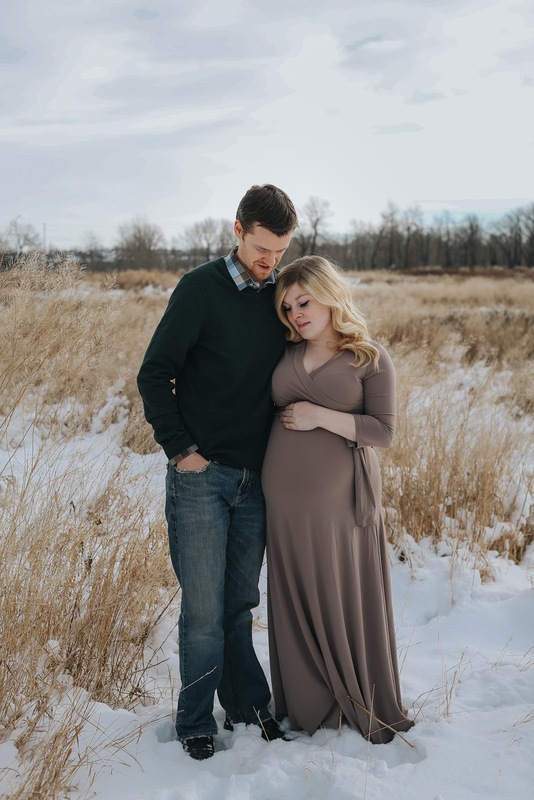 Though I still posted regularly to my Instagram over the past few months and continued to regularly provide updates through that platform, I unintentionally decided to take a break from blogging over the holidays and then continue my little hiatus after Bennett (our newest addition btw) was born. While it may not seem like it, putting together posts can be somewhat very time consuming -- especially for a perfectionist like me, and are quite a bit of work. However, I always love the end result, and because I thoroughly enjoy going back and reading through them, I eventually try to catch up when feasible (followed by me regretting my decision, as catching up is almost harder to do in the long run....). As I'll get to it further down in this post, my pregnancy also got quite painful near the end, and so I was just doing what I had too to get through my remaining weeks of work (made it to 38 weeks though!! 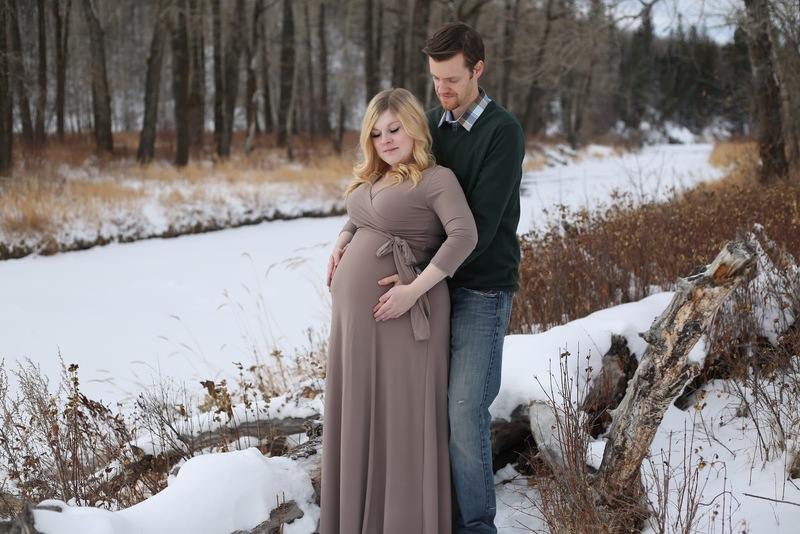 ), and get things ready for baby boys impending arrival. 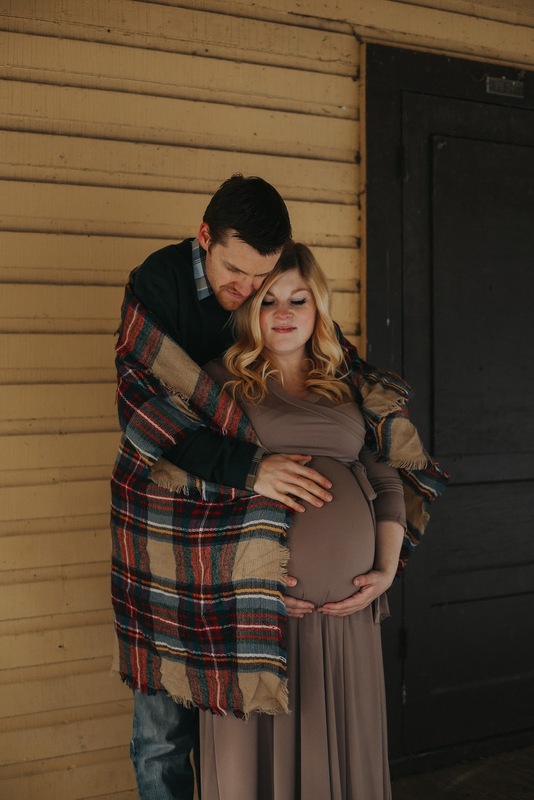 The last month of my pregnancy essentially became a situation of me trying to just get through each day -- doing only what I had to do (which blogging doesn't fall under), and keep the end goal in mind the best I could. How far along? 6 weeks postpartum..... oops! Total weight gain: Not sure, but was told that my weight gain and growth was deemed "great" this whole pregnancy and so I just left it at that. It was soo nice to not stress over it, and will start to focus on getting back into shape (and even those few remaining lbs I kept with Evanna) once Bennett is about 2 months old. Stretch marks? Some old and plenty of new. 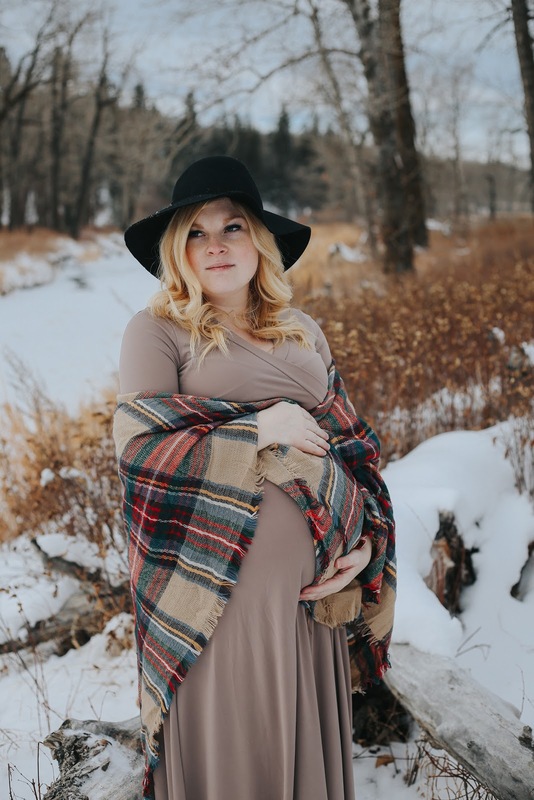 I remember being so concerned about stretch marks during my first pregnancy with Evanna -- but knowing they eventually fade made me stress a little less about them this time around, and have tried to ignore them as best I can. Sleep: Compared to my first pregnancy, sleep towards the end didn't get too awful. Sure, it wasn't the greatest, but I rarely had to get up multiple times in the night to go to the bathrrom, and lying down gave me the relief I was so desperate to get all day long anyways. Miss Anything? Being pain free. Sooo Bennett decided to "drop" when I was about 35 weeks deep down into my pelvis, and it made walking incredibly painful (like there were times I had to hold back tears and give myself pep talks when I had to go from my office and walk out to my vehicle). However, once he was born and found out his weight (a whole 2lbs bigger than his older sister btw), all the pain and difficulty to walk started to make sense (though, my 3rd degree tear brought on a completely different level of pain.....ugh). Though I was physically bigger with Evanna due to my high amniotic fluid levels (it was said she had an Olympic size swimming pool) -- she stayed up near my rib cage and never dropped -- so while I had a little trouble breathing when I walked around with her, this was on a whole other level, and I just wanted to go into labour and experienve some sweet relief (....only to unfortunately be in even more pain 2 weeks following his birth). Movement: Baby boy was definitely another little mover and shaker like his sister, and found he favored sitting on my right side. He didn't jab or bruise my ribs too roughly....but again, I think it's because he was so far down in my pelvis to do so lol. Food cravings: Despite being asked this question ALL the time, I honestly didn't crave anything in particular (unless you count ice chips as a food lol). However, I experienced horrible heartburn from about 26wks until I delivered, and there were definitely a few foods that made it worse than others (ie. meat). I was seriously popping tums like it was candy until a friend suggested I ask my OB about zantac (at like 36wks mind you).... which finally provided me some decent relief and definitely plan to take it much earlier in my next pregnancy and avoid the same (unnecessary) torture. Labor Signs: Lots around 38wks until I delivered at 39wks. Symptoms: Growing belly, the horrible, horrible heartburn (as previously mentioned) and awful lower pelvic pain. 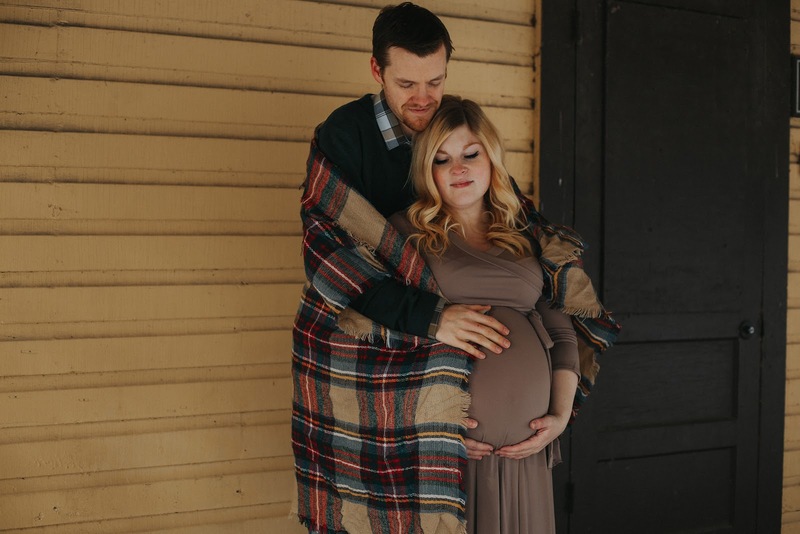 Finally, I would like to share some maternity photos that were so graciously taken by Jennifer of Cotton & Lace Photography. 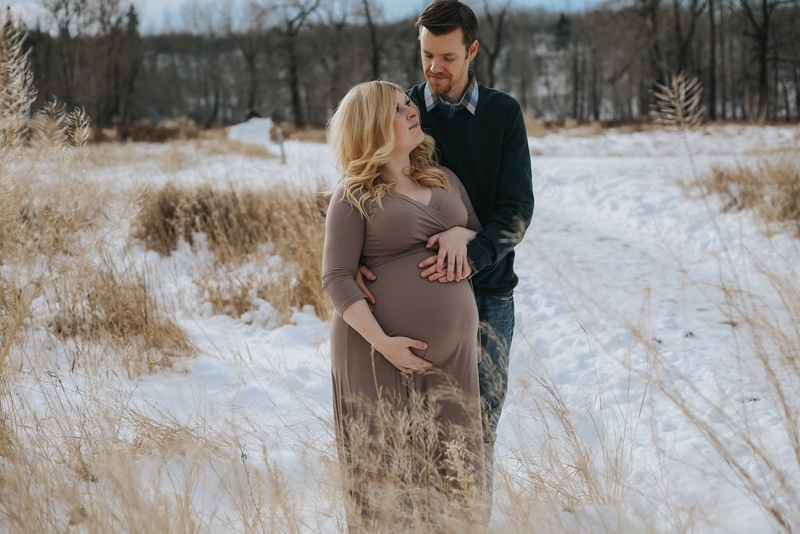 She's a popular photographer here in Calgary, and has done several of my friends photos over the years (including engagement, wedding and of course baby <--- which I feel is what she's most known for). Though it ended up being a super cold day when we did this shoot (which is why we opted to leave Evanna at home with nurse Carmen, instead of dragging her along and deal with her crying and dropping her oxygen saturations + need constant suctioning), Jennifer was super quick and was able to take several different photos in a timely manner. 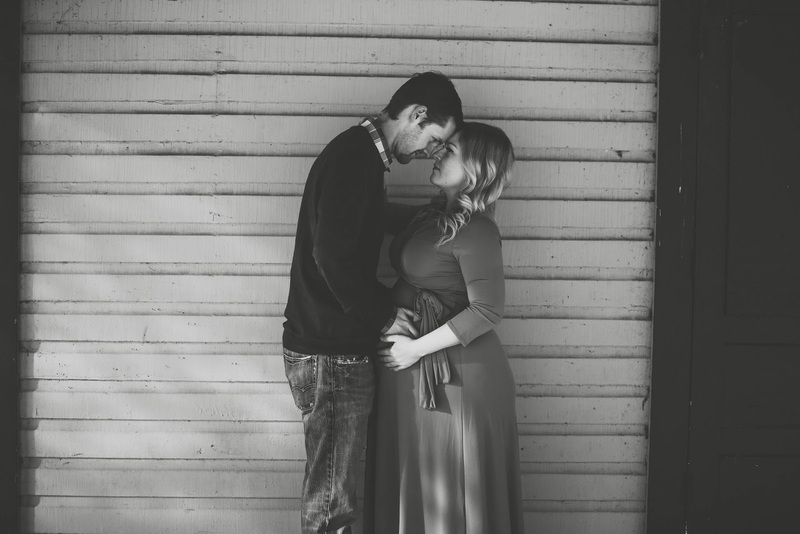 I originally had no intentions of taking maternity photos in the first place (minus our original pregnancy announcement photos ---> with the rest posted here) -- especially this late into my pregnancy (as it's when I feel like I go from what I call "cute preggo" to feeling like a whale) -- I'm glad to have these and will cherish them dearly. Thanks again Jennifer! !